Why are Private Equity acquirers becoming such an attractive option for SME business owners? Private Equity (PE) buyers have been around a long time – responsible for some of the largest, headline-grabbing transactions in M&A. However, for the mid-market and SME private business owner, PE acquirers have had a mixed reputation. Historically, PE firms weren’t seen as a viable acquirer by many exiting shareholders who were put off by negative reports about PE deals in the press and horror stories from fellow business owners about poor deal structures, low valuations, massive debt and post-acquisition issues. M&A advisors have also had mixed experiences with PE in the past. It was often the case that the return on investment model applied by PE meant lower valuations, complex deal structures, and unfavourable terms for clients. All this resulted in PE struggling to compete against trade. But over the last decade – and especially in the last 5 years – something has drastically changed. PE acquirers are becoming increasingly prevalent in total M&A. The latest figures include some of the private equity industry’s biggest deals since the financial crisis and PE buyers accounted for nearly 10% of all acquirers in global M&A in 2017 – the highest level recorded. In the mid-market and SME sphere, there has been a seismic shift that demonstrates an overhaul to the PE investment approach. 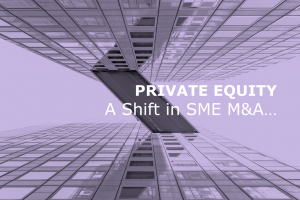 We now see PE outbidding trade acquirers on a regular basis and Private Equity acquirers are now an attractive option for SME business owners. In transactions involving UK targets in deals up to £50million, the percentage of outright private equity acquirers has increased – now accounting for 14.65% of all acquirers in 2017. This is a 10.5% increase on 2015 and a massive 63% increase over 2009 PE acquirer levels. EvolutionCBS has seen a marked increase in the interest from PE. In the last 18 months, there has been an offer from a private equity acquirer in 83% of our sale mandates. In our last 6 successful completions there werea total of 53 interested parties (a mix of trade and PE acquirers). In these last 6 completions, 4 clients to sell to a PE buyer. In February 2018, EvolutionCBS led the sale of M J Wilson to specialist PE firm Caingorm Capital Partners. Cairngorm saw the business as an ideal platform for growth in the MRO space and outbid high interest from a range of acquirers; including strategic buyers from the USA looking to enter the UK market. PE outbidding motivated strategic trade would have been very rare 10 years ago. So, why has PE changed? The change in PE approach directly reflects the current market environment. There is significant competition in the sector; the number of UK PE firms continues to rise and they face fierce competition for assets among themselves, from strategic corporate buyers and institutional investors. At the same time money continues to flood into the sector. Cheap debt and highly favourable borrowing terms means many PE firms are raising record levels from investors. With unspent capital and huge funds at their disposal, there is increased pressure from investors for private equity firms to put this money to work. With a limited supply of quality opportunities and an abundance of funds (and pressure to use them), PE firms have realised that they need to compete and differentiate themselves to secure targets. Reputation plays a vital role in PE dealflow. PE appears to have realised that their reputation needs to be excellent not only with potential targets and their advisors, but with investors too. This perfect storm is fuelling the increased activity and competitiveness of PE acquirers. So, why is PE now so attractive to mid-market and SME sellers? In short, price and deal options are the key factors. PE no longer lags trade in terms of valuation. EvolutionsCBS are seeing this across the board in our transactions. PE valuations for clients are invariably on par with, or even better than, trade. There is also a wealth of PE houses with different focuses, specialisms and values. This means that EvolutionCBS can not only bring a variety of trade buyers to the table, but there is now a wealth of PE options for clients too. There is now more choice for clients which ensures they can be certain they’ve found the right PE partner for them. Clients can now look beyond the financial numbers and be certain there is a match in terms of ethics, working ethos, personalities and vision for the future. PE buyers no longer simply offer investment. They bring a wealth of experience, expertise, relationships, and skills that complement shareholders’ skillsets. PE now brings investment and a commitment to add real value. The myriad of deal structures PE can put together, along with the expertise, relationships and growth opportunities they bring to the table can offer an exit route that trade can’t match. This, coupled with strong valuations, means EvolutionCBS now sees many more clients deciding to cash out a lump sum now, but retain a stake and join the ride under PE ownership – excited about the future. Have you considered the current operational and financial health of your business? Complete your free online valuation here.